If you are thinking about getting one of those cheap - as in price - Chromebook's you have heard about but do not really know if they provide you with all the functionality you need from a computer system, you have now the chance to take Google's Chrome OS, the operating system powering the devices, for a test drive. All you need for that is the latest Google Chrome Canary version, the more than cutting edge version of the Chrome browser. Once you have installed the version on your operating system, supported are Windows XP to Windows 8, and Mac OS X, you can start the Chrome OS window with a click on the settings button and the selection of Open Ash desktop or the shortcut Ctrl-Shift-A. Note that it will load in a new window that is more or less black to begin with. You get a selection of app shortcuts at the bottom that you can start to launch services such as Gmail, YouTube or Google Search. These services open in a window on the screen that you can move around or resize. All windows that you can spawn here look more or less like Google Chrome, with the different that you get maximize and close buttons for each window individually here as well. You can alternatively click on the settings button to display a selection of settings of which the majority do not seem to work right now. While you can click on the shutdown button to close the window, a click on settings does nothing at the time of writing. The underlying Chrome Canary browser crashed whenever I closed the Chrome OS interface that I had just launched. It is likely that these bugs will be sorted out in future releases. While you can get a first impression of Chrome OS using the Ash functionality in Chrome Canary, it does not provide you with the full functionality right now. 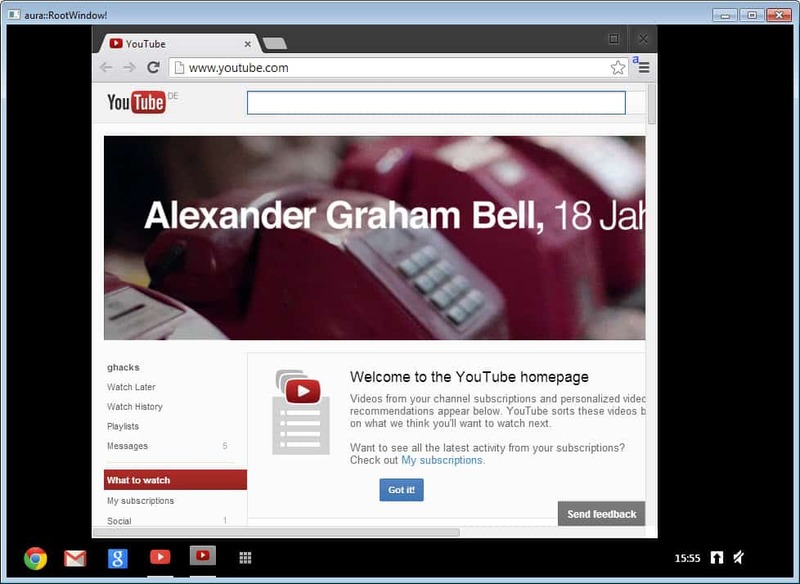 Still, if you run Canary anyway or do not mind running it in addition, you can get a glimpse of what Chrome OS has to offer. Update: Latest versions of Chrome Canary do not seem to offer the link in the context menu to launch Chrome OS. What the difference in usage of chromebook vs Windows RT as a computer? Well Chrome OS is basically an operating system that is a browser and while I can’t say for sure if it is still the case, requires online connectivity. Uh, nothing happens when I push ctrl-shift-a, and there is no “open ash window” in the settings. Help pls? Yeah, I seem to have the same scenario as well. Any reason to this? I believe I’m running on the most updated version of Canary. Thanks. I’m having the same issue. Has the browser updated but NOT to Canary? Right now it’s causing canary to crash. It may take three builds before it stops crashing. Works fine for me. Pressing ctrl+shift+a opens a new window with Chrome OS in it. Very cool. Make sure when you have Canary open it is the active window, and then open it. If if is not active using the short cut does nothing. Seems to have been removed altogether from the version the article links to. Perhaps the article should be updated or removed. I still have that option in the latest version of Canary. Is that the same as yours, Martin? Don, I rechecked and noticed that Canary was not up to date. I updated the version and now it is not there anymore as well. I will update the article. What a shame. I wonder why they removed it. Do you know where a back level version could be obtained that still has it? Sorry I do not know where to get an older version of Canary. I don’t find “settings button and the selection of Open Ash desktop” :-j ?? ?